Just got an update and spoke with Emergency Info. Center. 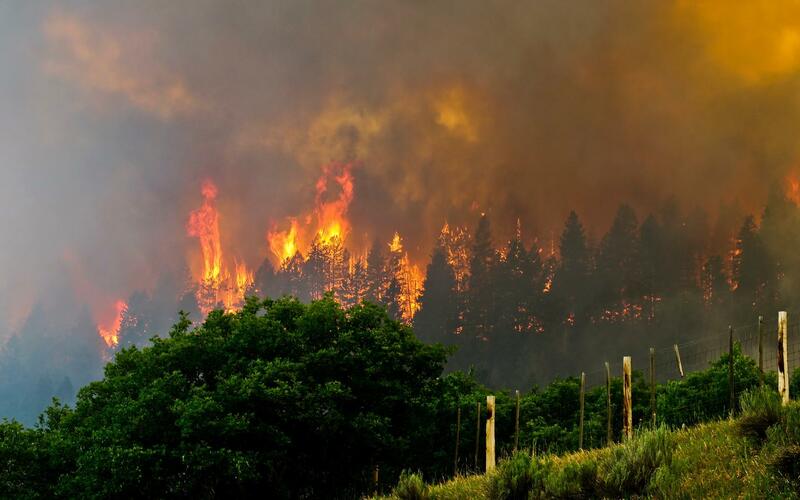 Fire has crossed Hermosa Creek and grown a great deal. Red Flag fire conditions today and tomorrow - hot, low humidity and gusty winds. Falls Creek Ranch is now being evacuated, just up CR 205 from us. We will likely be evacuated shortly. 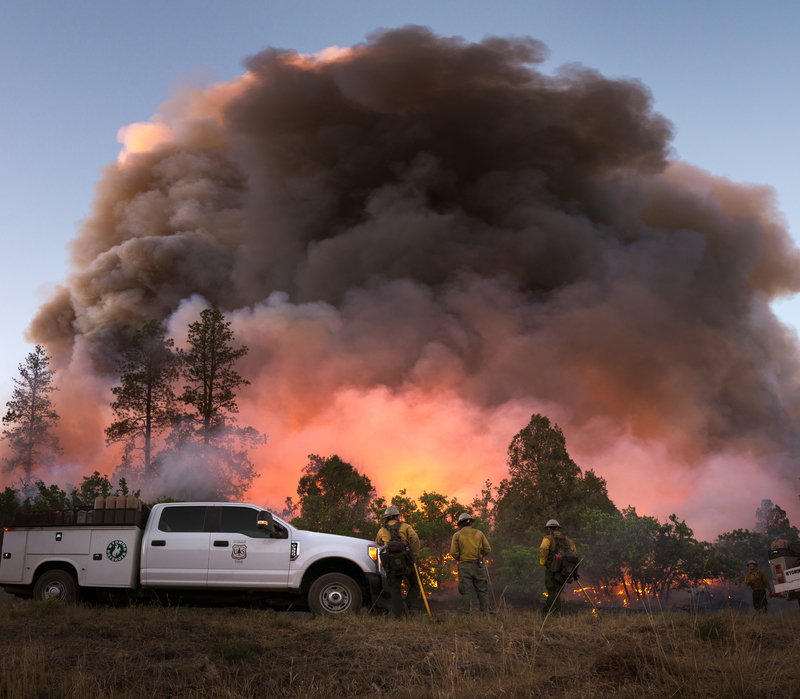 Burro Fire, about 12 miles west of the 416 fire erupted yesterday afternoon and grew last night. Unbelievable courageous and effective fire fighting has resulted, as of now, in no loss of life or homes. Still lifting y'all up, DP. Gosh, DP. I've been watching this and it's not good news. Except for how well firefighters have worked. I suppose you and the Mrs have lost a lot of sleep over this. Continuing prayers up your way. That’s a pretty thorough update, Goose. The weather conditions are about as bad as they can be for fire behavior and the forest was already bone dry. Deeply appreciate the concern and prayers. Pray for the fire crews and pilots. The only loss of life during our last big fire in 2002 was a fire fighter. Those people are absolutely amazing and at tremendous risk. While I was loading up the car and getting the house evacuation ready today, Debbie was in town buying groceries for the firefighters camp. We’ll likely have plenty of warning to get out before we’re in personal danger. We have no dogs at the moment we have to be concerned about (a blessing, as it turns out). And Debbie dug out the blueprints for our house yesterday in case we need to rebuild. Just don’t want people or livestock to get hurt, and so far that’s the case. Steve where do you evacuate to? Neighbors in the valley are all connected by texting and providing assistance to each other as needed. I’m always heartened by the way neighbors come together in time of need. We have dear friends who are currently out of danger who’ve offered to take us in. Actually, we’ve had several friends call to offer us a bed. As a kid I was inspired by smoke jumpers. 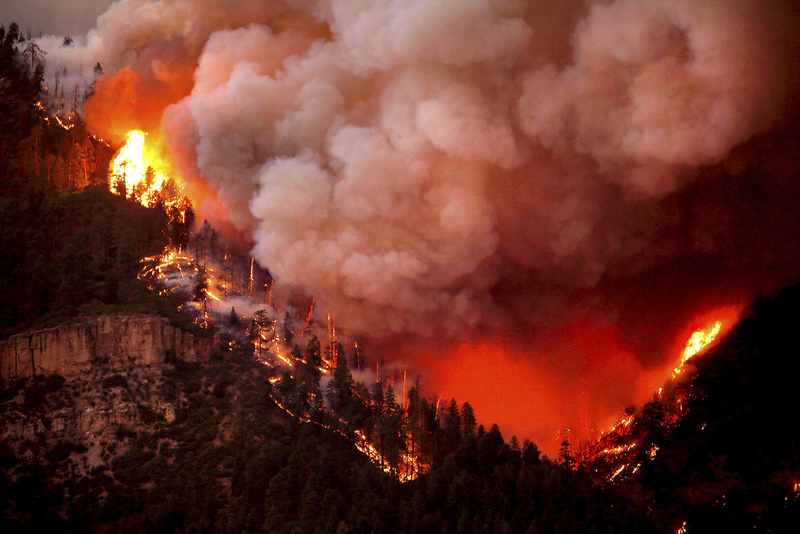 I wish I was physically able now, to go up there and volunteer to help fight that fire. My fire fighting days ended when I turned ~63. Praying they get it under control soon if not already. Looks like this monster is going to burn until it starts raining. The fire doubled in size yesterday. Now at ~17,000 acres, a little over 26 sq. miles. Currently expanding mostly into wilderness and primitive areas. But the northern spread is starting to threaten homes near the ski area, and if it continues to grow to the south a lot of homes will be in its path. Another red flag warning today. Hot, humidity in the single digits, wind gusts at 25mph. I took some more stuff up to my office today. From campus you can see the 416 Fire and the Burro Fire - which also grew yesterday. Looking north from school it looks like everything north of town and west of the Animas Valley is burning. I see there is rain forecast for Durango proper but no appreciable amount until next Sunday. And then only 1/2 inch. Lets hope there's a lot more rain than that, especially up on the mountains. I don’t think I’ve ever seen humidities that low. Also just heard on the 2m ham radio that the caretaker (a ham) has been sent up to Falls Creek Ranch (subdivision that’s been evacuated just up the road from us) to turn off all the water at the homes to keep pressure up in their hydrants. No hydrants where we are. Deeply grateful for your prayers. 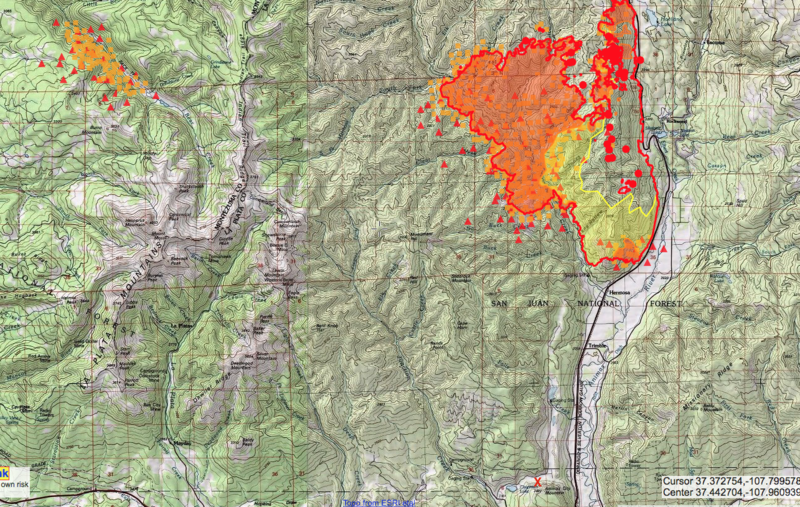 Here's the most recent fire map I could find. The fire to the west is the Burro Fire. The fire to the east is the 416 Fire. I marked our house with an X. 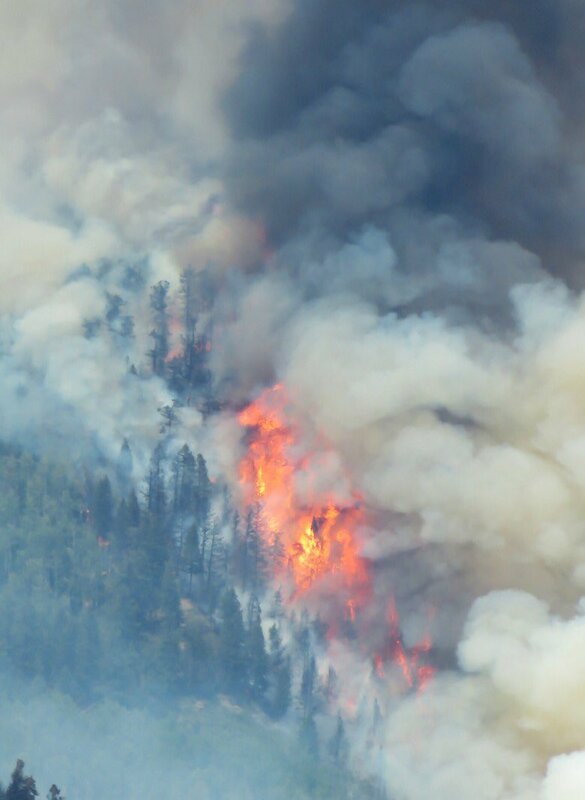 The Burro Fire is burning in the Bear Creek drainage now. That's one of the best trout streams in the country. A little extra hazy over the northern front range this morning. The weather guy said it's from the 416 fire. We couldn’t see the sandstone wall 150 yards from our front porch this morning. The more real it gets up in there, the more fervent and frequent our prayers. 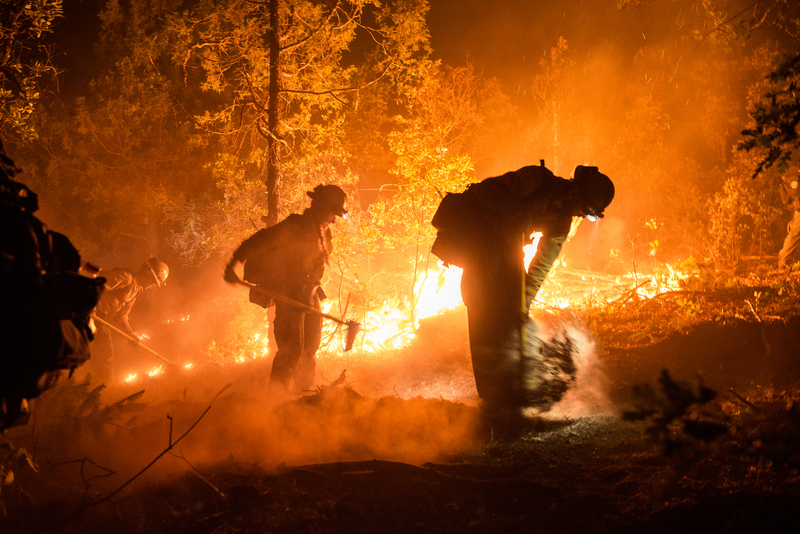 So far, firefighters’ priority has been to protect lives and homes and they’ve done an amazing job of that. 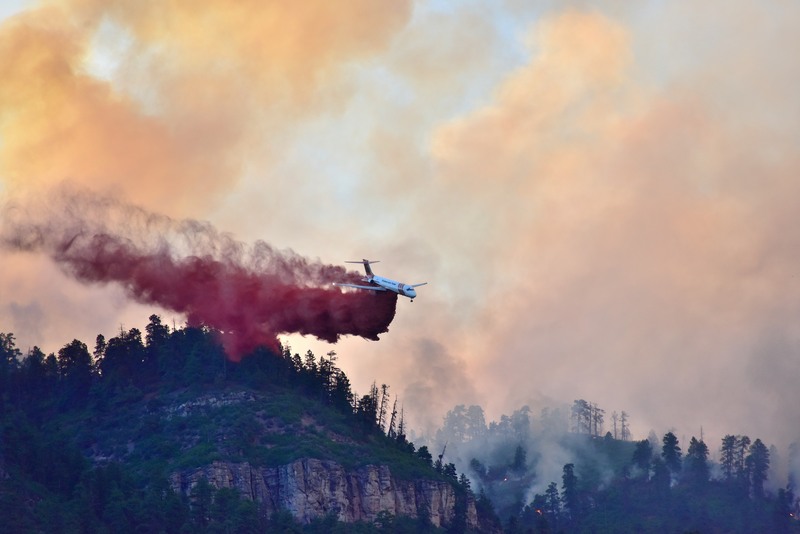 Last night, just before dark, we were listening to “416 Air Tac” on the scanner calling for a slurry drop to protect homes in Hermosa in “imminent danger.” One plane came out of Grand Junction and got here just in time.